This top is for skirt wearers who don’t want to wear fitted tops or tucked tops with skirts, culottes or wide crops. The tie-front top is a good solution, because you wear it over bottoms thereby covering some of the waist and midsection bits. The fluid fit is breezy on hot days, and will fit an assortment of body types. The tie provides structure by shortening the length of the top, and tapering the fit to showcase the contour of the body. 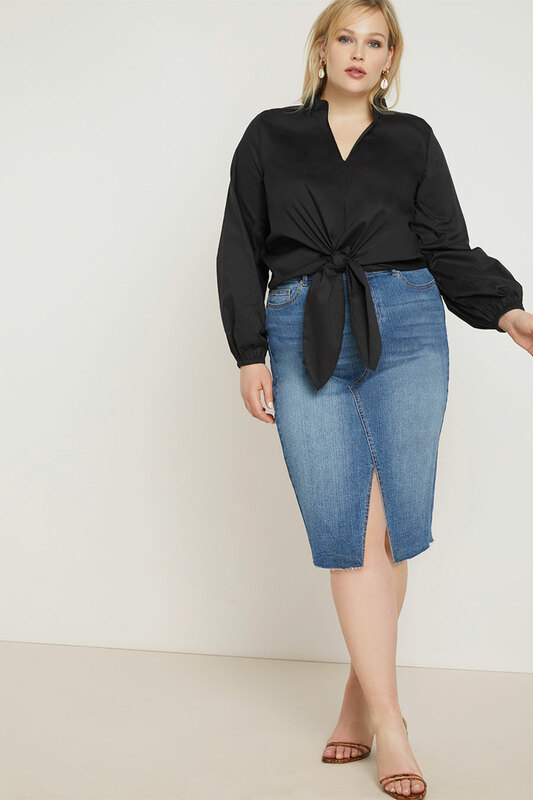 Of course, you can wear tie-front tops with jeans, pants and shorts as the stock photos show. 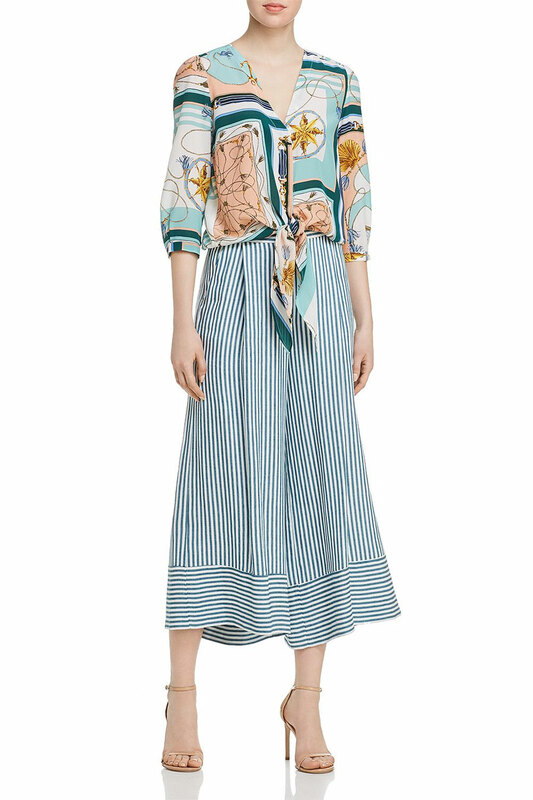 But since skirts languish in closets when they don’t have tops to wear with them, I’m emphasizing how well the tie-front top can work with straight, A-line and flared skirts. The tie-front top comes in all sorts of colours, patterns, fabrics, and with assorted necklines and sleeve styles. Some versions are dressier than others. The style of the tie and length of the top can vary too. Some are longer, thereby covering more of the midsection. Some finish on the waist, while others expose the midsection. Some ties tie to the side. Take your pick. The V-necklines are particularly flattering on petites, shorter necks, and larger busts. The knits are usually easier to launder than woven versions, but the wovens look more crisp. The button-through style is not problematic for curvy figures with larger busts because of the fluid fit and structure created with the tie. Try the tie-front top if you have orphaned Summer skirts. Make sure the length is right so that you’re confident with the fit on the midsection. You might need to size down if the fit is too blouson-y. Shorts in all sorts of lengths, fabrics, colours, patterns and silhouettes are more on-trend than ever. In my experience with my clientele and what I see on the street, most enjoy wearing shorts that are mid-thigh length or shorter, especially in the US. Personally, I prefer the look of shorts when they’re a little longer, with lengths ranging from right above the kneecap to just below the kneecap like in the outfits shown here. Some call these longer shorts bermudas. There is no right or wrong length, but simply your preferences and comfort levels. Shorter shorts might be your thing, or you may enjoy showcasing your legs. For those who like to wear longer shorts, there are plenty to choose from this season. Here are some casual and dressy looks with longer shorts and Summer sandals. The leg silhouette can taper or flare out. Feel free to use any colour palette. White denim looks great with pastels and blue denim. Combine a pastel top with white shorts in cotton or denim and top things off with a blue denim jacket. Finish off the look with white, metallic, tan, or pearl grey sandals. Crisp and dressy blazers can create a fun juxtaposition with denim shorts, which can be mildly or hectically distressed. Add a layering top and sandals, and you’re done. Here the white sandals pick up the white of the tops, but you can sport any colour. I adore the combination of fluid top with dressier shorts. The dainty flat sandals are the crisp cherry on top, thereby adding to the relaxed and breezy elegance of the outfit. They also pick up the white of the top. Combine a pair of dressy long black shorts with a dramatic and dressy top, and see what happens. The shorts are dressy because of their fabric, length and silhouette. 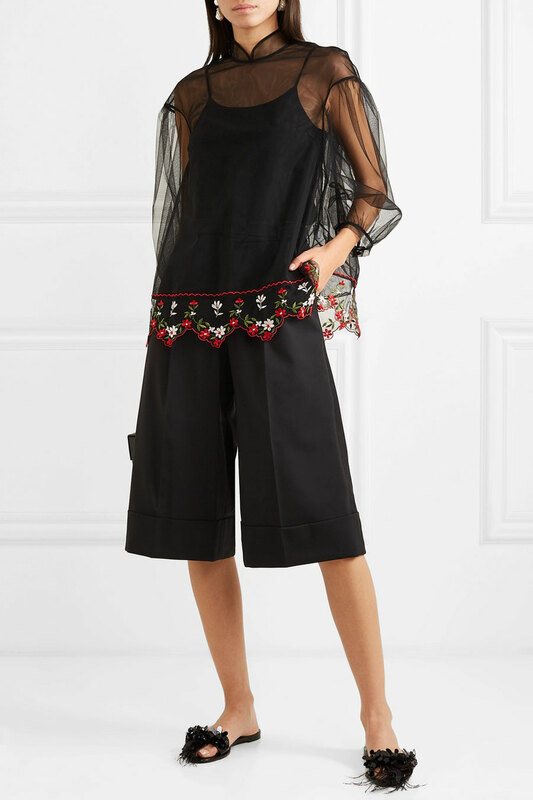 The sheerness of the black top breaks up the expanse of the black, as does the embroidery. Finish off the look with a dressier sandal, slide, or mule. I don’t wear shorts because I prefer to wear midi skirts, dresses and cropped pants when it’s hot. That said, if I were to venture back into wearing shorts, I’d wear the longer lengths that cover the kneecap. How about you? Do you like to wear long shorts, or do you prefer then mid-thigh and shorter? Jumpsuits and rompers are all-in-one garments. Somewhat like a dress where the bottom part resembles pants instead of a skirt. Rompers have shorts on the bottom, whereas jumpsuits are cropped pants or full-length pants on the bottom. Rompers are sometimes also called playsuits. Jumpsuits and rompers come in all sorts of colours, patterns, fabrics, and silhouettes. They can also be dressy or casual. Here are some examples. Jumpsuits and rompers are an acquired taste because, like most wardrobe items, they have their fab and not so fab attributes. I have a jumpsuit, which you might remember from this old outfit post. It’s four years old and I’ve worn it twice because it’s THE fussiest, most uncomfortable, and most impractical item in my wardrobe. I thought it would be fun to wear because I love the glam ‘70s, but all it does is drive me bananas. I have to wear it with two and a half inch heels that I no longer own or wear. Going to the loo means I have to strip to my undies leaving the jumpsuit rumpled at my feet, which is a lot of fabric because of the long flared legs. In short, it’s an awful wearing experience. Yet, I keep the jumpsuit because it’s a spectacular and well-made designer piece. I keep on thinking I’ll haul it out for some glam occasion, in which case I’ll need to hem the length to wear with one and a quarter inch heels. I LOVE the look of jumpsuits for the fabulous reasons I’ve described up top. They’re such a fun, unique and easy piece if you’re fine with the impractical part when going to the loo. I don’t know if the experience of wearing this jumpsuit has put me off for life, but I guess there’s only one way to find out. I’ll need to try a shorter version that I can wear with flats, and that isn’t as big a rumpled mess on the ground when I need the loo. Maybe a boiler suit of sorts, which I happily wore in the ’80s. Over to you. What’s your take on jumpsuits and rompers, and do you wear them? Lots of blue, some green, and a good amount of dressy in this week’s top picks. An assortment of top picks in versatile neutrals for transitional weather. Some raincoats, blouses, shoes, jackets and a necklace that are top picks right now. An assortment of top picks across colours, silhouettes and price points. Some to wear now and into Spring to wipe away those Winter blues. Some top picks in lilac, red and neutrals across all wardrobe items. 1901 Pleated Polo Midi Skirt: The most streamlined pleated skirt I've seen so far. It wowed me when a client combined it with an assortment of navy and white striped tops and white sneaks. SUPER cute and comfy. Rag & Bone 'Boyfriend' Leather Belt: Teal Belt Fabness. Boden Silk Shirt: I've been off silk blouses until I tried this one because it's a cut above the rest. Gorgeously luxe fabric and fit. The armholes aren't too low, and the shape is fluid but flowing in a way that I don't look like I'm wearing a tent. The curved hemline helps too. I'm wearing this blouse OUT and untucked over tomato red jeans which is atypical. The vertical integrity of the colour blocking is striking, and makes all the difference. Comes in a few patterns, and the length is quite long. Reiss Colleen Polo Pocket Sweater: Gorgeous crisp and pretty piece that is badly styled here. It's quite long and has a substantial welt, so it looks GREAT worn over slimmer pants and jeans. It's not supposed to be tucked! More cream in person, and might run a size small. Bike shorts worn as casual and smart casual wear are a fringe trend. As an extension of the Sporty Luxe and Athleisure trends, it makes sense that the item is having its fashion moment. If leggings can be worn as pants these days, why shouldn’t bike shorts be mainstream. Most trendy bike shorts are black, but come in colours and patterns too. They don’t have the padded seat and crotch area like real cycling shorts, but are rather a much shorter version of leggings. Fabric is thick, substantial and opaque. The idea is not to look like you’re going to the gym or climbing on your road bike when styling them. Wear them with regular casual wear like tees, shirts, blouses, knitwear, hoodies, denim jackets, bombers and casual footwear. Or dress them up with a blazer, top, heels and bling. The collection below provides examples of the look. You can go to town styling bike shorts in a fashion forward way, like the outfits here, with a turtleneck, leather blazer, sporty sandals worn with socks, and transparent bag. Or belt a long blazer with a waist-cinching belt and add a pair of booties. I like the bike shorts trend because it looks different and new. I prefer the dressier outfits because of the interesting juxtapositions. If you enjoy showcasing your legs, this is one way to go. Like leggings, bike shorts are easy to fit and you can choose a length. I like them just above the kneecap. I am a yay for this trend on others. That said, I’m a nay for myself because I don’t wear shorts, and I loathe the feeling of body-con spandex clothing on my body. What do you think of the bike shorts trend? Do you like it, and would you wear it?